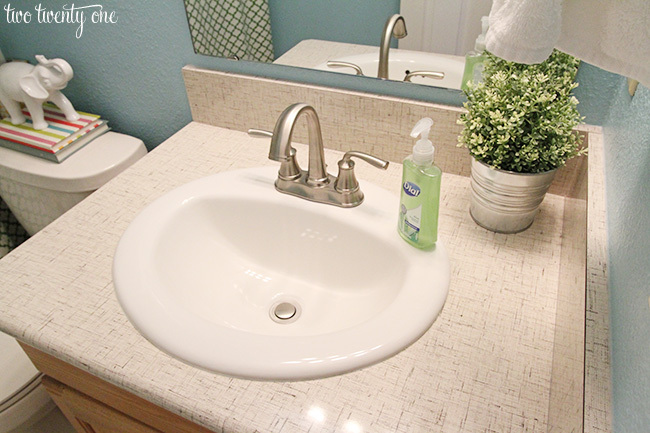 Back in March I shared that we were getting new Formica® Laminate countertops in our master and guest bathrooms. Last week the countertops were installed, and then we spent the rest of the week installing the new sinks and faucets. 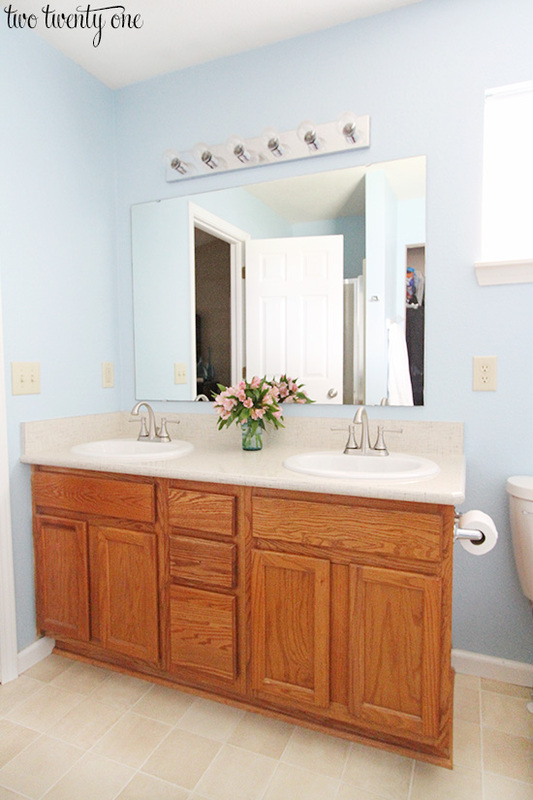 For reference, here’s what our master bathroom vanity looked like before. We had pretty plain, laminate countertops and chrome faucets that came with the house when we bought it 6 years ago. And here’s what the master bathroom vanity looks like now. Since the installers pulled out the entire countertop, we had to install new sinks and faucets. So we purchased some drop in sinks from Lowe’s. I won the faucets in a giveaway a couple years ago. They’ve been in our garage collecting dust because I wanted to wait until the countertops were updated to install the faucets. 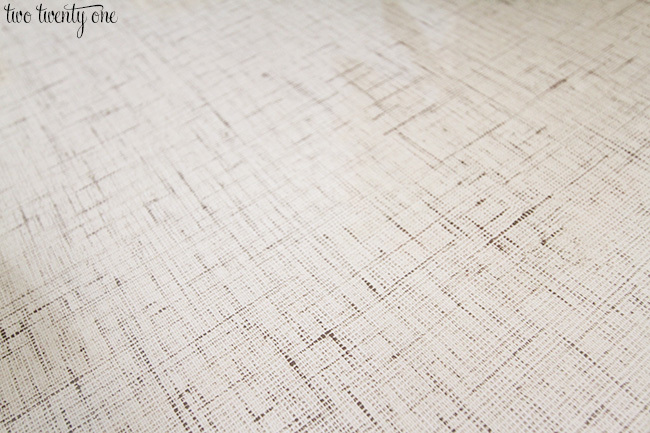 The pattern I chose was Crème Lacquered Linen from the Formica® Laminate Jonathan Adler Collection. I like how it’s modern and simple but there’s texture for visual interest. Check out all the patterns Formica® Laminate has to offer and get a free sample here. I think the Crème Lacquered Linen is perfect if you’re looking for something neutral that isn’t a stone pattern. The faucets are by Moen– the Ashville collection in brushed nickel. Then there was our guest bathroom. Same boring countertops as the master bathroom countertops. The seam on the side splash always bugged me. I hated the seam in general and how it was taller than the backsplash. It just looked like it was thrown together. And I wasn’t a big fan of the faucet either. Now it looks so much better and like a custom job. We chose for both countertops, an edge of the product that was post-formed for a clean, seamless look. We installed the same drop in sinks that we used in the master bathroom and a new faucet. Although I didn’t win this one so I purchased it at Lowe’s. It’s by Delta– the Lorain collection in brushed nickel. My next plan is to stain the vanities, well, at least the master bath vanity. 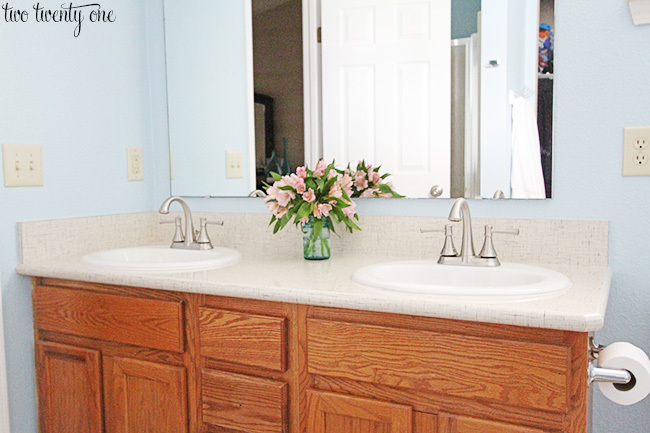 The darker vanity will really make the new countertops pop with more contrast. And I need to update both vanities with hardware. Want to enjoy a new Formica® Laminate countertop as well? Today we’re giving away a $100 Lowe’s gift card to get your project started! To enter for a chance to win, just let me know what you think of the new countertops. This giveaway is open to US Residents age 18 or older (or nineteen (19) years of age or older in Alabama and Nebraska). Winners will be selected via random draw, and will be notified by e-mail. 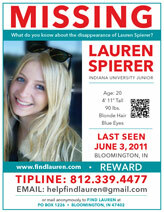 The notification email will come directly via the sweeps@blogher email address. You will have 2 business days to respond; otherwise a new winner will be selected. Be sure to visit The Formica® Brand’s page on where you can read other bloggers’ posts! Awesome! I would love to have these in our home. Thanks for hosting! Your flowers look great too! 🙂 Thanks for hosting. 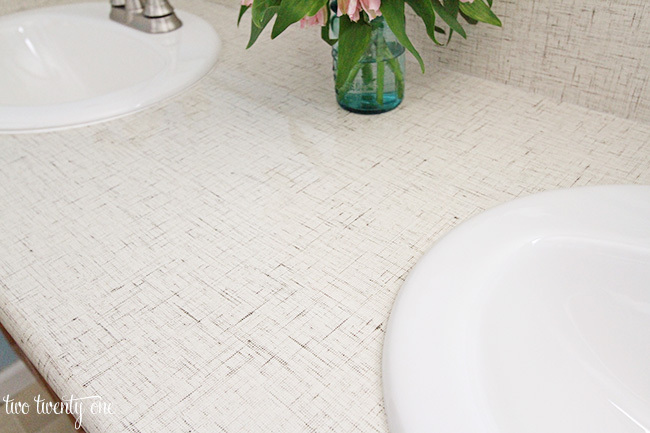 I would totally use new countertops in our bathroom makeover…it is screaming for help! Countertops, vanities, etc would be welcomed in our new-to-us 1959 home! The linen, blue and silver really go well together. Very clean look. I wonder what other patterns they have. I’m interested to see how you stain the wood. I think we have the exact same cabinets. I love the look! It’s giving me great ideas for updates to our bathrooms. Hope you post a tutorial on the staining when you complete it – that’s on my list of projects too! I love that design on the countertop! They look great, can’t wait to see them with the stained cabinets! Your new countertops look great! I like the look of the countertops. They are so unique! I would like to do something like this in my guest bathroom. Right now, we have a pedestal sink, but I’d prefer a nice countertop with cabinets for storage. We’ve been wanting to redo our kitchen countertops since we moved in to our 1980s home. Thanks for a great giveaway! Love the new laminate! I can’t believe how good laminate looks now. We live in a little starter ranch a lot like yours, so we have all laminate countertops too. The kitchen and guest bath aren’t bad, in fact I actually like them! What I hate is our master countertop. I don’t know why- it’s just plain white but it drives me nuts! And also it shows every hair, spec of dirt, drop of makeup… Sheesh. Thanks for hosting this giveaway! I had no idea that there were such pretty choices in Laminate. I love the linen look…it is so fresh and clean! I really like how the counter tops came out. I am definitely itching to update our outdated bathrooms. The countertops look great! I really like the faucets! The question confuses me, but those countertops and high backsplash look great! Love it! Looks so nice and the master bath will look great stained too! I have been saving for new counter tops in our kitchen and bathrooms. Changes the whole look of the room!!! I love the new countertops! The sinks and new faucets look great, too! I’ll have to check out the J. Adler collection asap! Love the countertops! Would love to do the same thing at my house. We have plain white countertops and this is a great option! Thanks for all the ideas!! Love the “textured” look of the countertops! Your reno pics are a big reason I’m considering using Formica when we build our home. Thanks! I love these! I don’t know that I’ve seen many countertops with a pattern other than stone, and they look really nice. With 2 kids under three, I’m totally down for laminate countertops! They’re so easy! 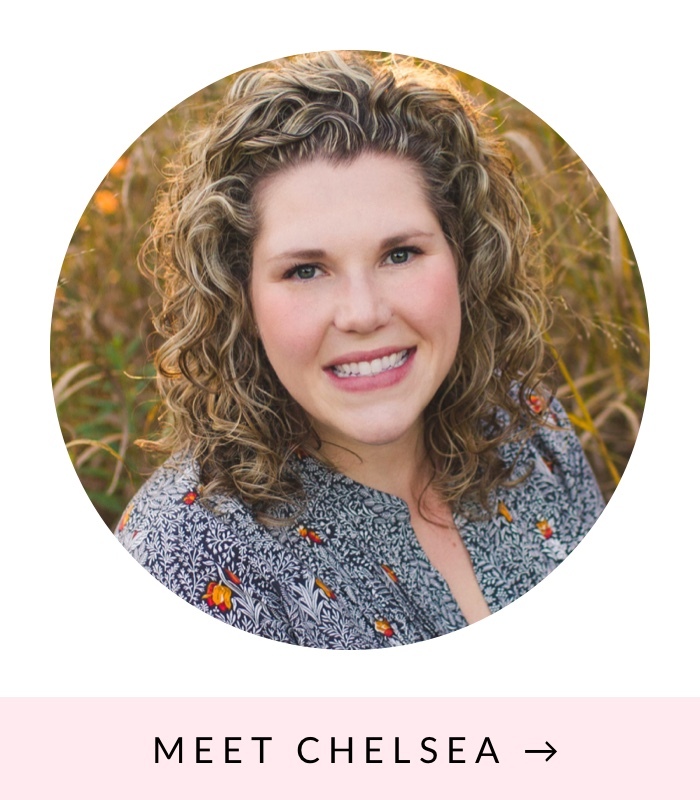 And I’d love that gift card, because I’m currently saving to replace my kitchen countertops after my (darling) husband burnt a ring in them with a boiling pot of green beans. P.s. I’ve really been enjoying the podcast! Looks great!! I would love lighter and brighter counters too!! Love them. They look great! What an interesting look! I’ve never seen countertops like that before. I’m on the fence, but I agree, with a darker cabinet, they will POP! Nice to see a makeover using a very affordable material. Looks very clean, fresh and inviting. What a great giveaway! I can always find something at Lowe’s! Your bathrooms look great! I love the look of the new countertops! I love them. I’ve been dying to upgrade our guest bathroom countertops. I love that linen counter top. So much different than the ordinary stone look! We could use a new one. Our current model is chipped! The countertops look so cool! I really love the textured look! Love how clean the look is! Recently discovered your blog and have been using so many if your great ideas. I look forward to reading your blog! 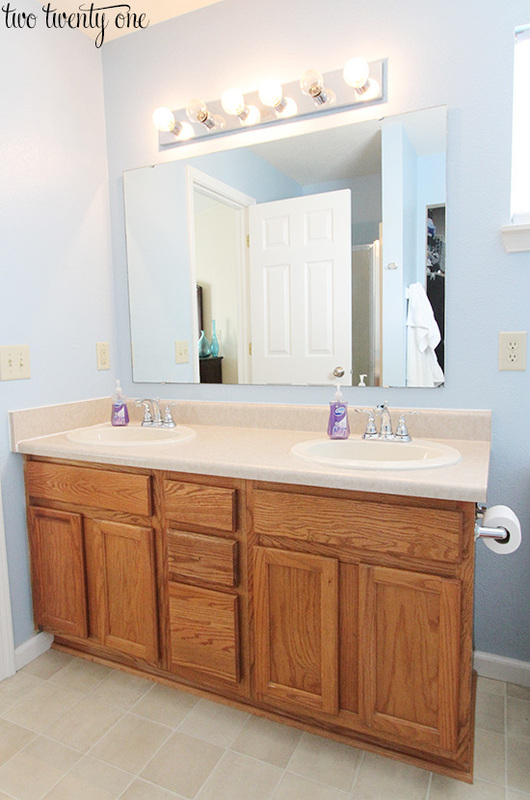 We are moving next month and we would..okay need…to fix up our new bathrooms. What a fresh new look. I love the linen pattern. 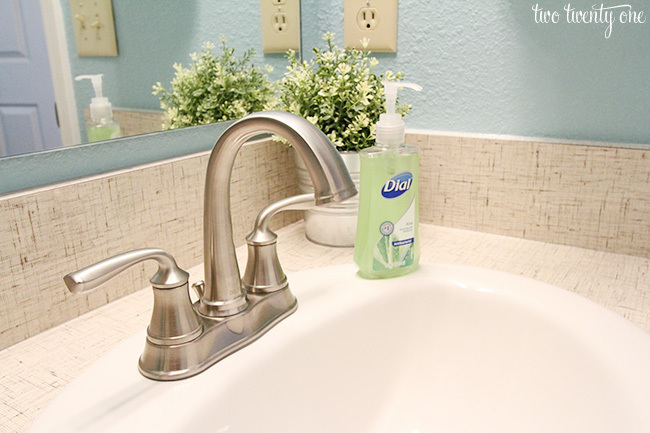 You now have freshened up bathrooms without having to endure a complete redo. Looks good. We are in desperate need of replacing our kitchen counter top. This would be perfect! 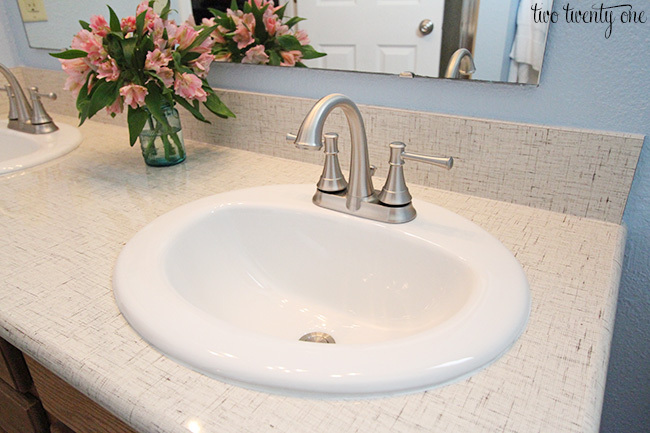 I love how the new counter tops freshened up your bathrooms. Very nice update! I Love the linen look instead of stone. Our 4 bathrooms really need an update as well! 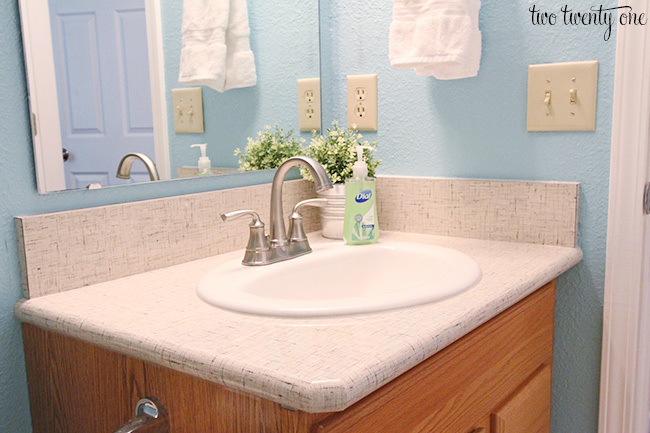 We have older laminate counters in our bathrooms that I’d love to update too! Love the neutral color that you chose, compliments well with the fresh blue walls! New bathroom countertops would be great! Your flowers look lovely! I like how your countertops have a little interest without being over the top. loving the subtle linen pattern to these! The counter tops are so pretty (and I love how you did the edge!)! 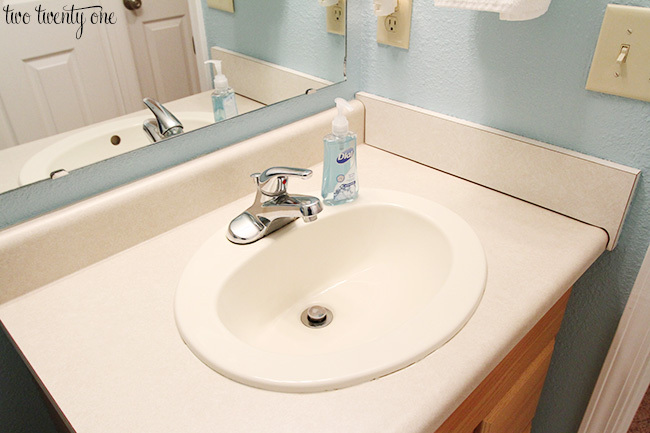 Could you have undermounted your sinks? Not sure if that is possible when you use laminate? I love the texture and the rounded feature of the edges! Who knew you could do that with laminate… not me. I love the new counter tops they look so clean and modern. I love how you update your house with small changes that create a HUGE difference. You’re right when you say you don’t live in a “granite countertop” house. I feel the same way about mine and as we do updates I try to keep that in mind so we don’t overspend and make bigger upgrades than necessary. The countertops look amazing!! Great job! 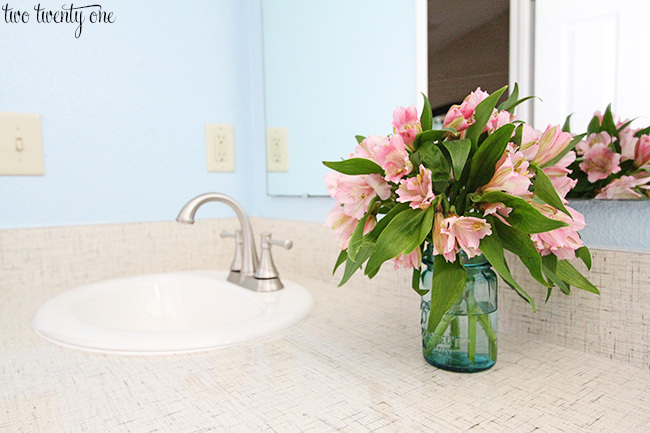 Our faux-stone countertops could also use a refresh! These look great! The new countertops are really nice! I love that they have “built-in” texture and think they will look great with a darker-stained vanity. Who knew there were so many new stylish choices in laminate these days! Looks great! We’re moving and could definitely use some new countertops in the new house! I love the countertops! We recently purchased a home that hasn’t been remodeled since the 70s and I would love to try something like this for our ugly kitchen counters. I love your new countertops! 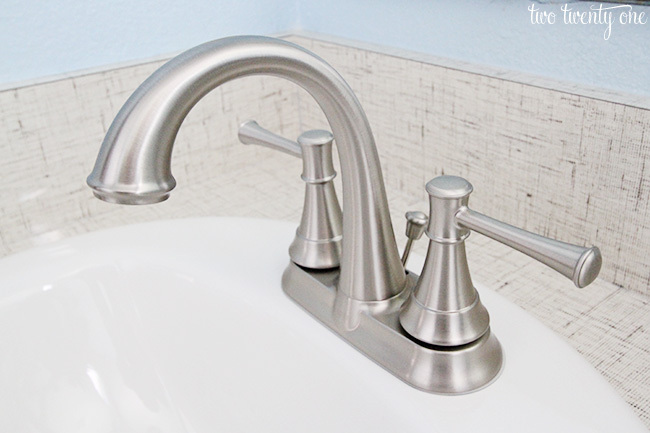 They work really well with the new sinks and the brushed nickel faucets. I’m jealous! Love your new countertops! I totally need a bathroom makeover as well! I love those countertops. They would look great in the house I’m remodeling. so funny how the simplest of changes can make such a difference! Keeping things you, while making them better is so gratifying! I would love new counter tops in our bathroom! Formica has made leaps and bounds in quality and choices! It definitely gives a wider range of options for midpoint priced countertops, while still letting the homeowner have custom looks. I love that design on the countertop. They look great! I am in love with those countertops! It really freshens things up! Laminate has come such a long way! Very nice!!! We’re buying our first home and these countertops would look awesome! They look very good. I really like the faucets. the countertops are amazing looking! like the seamless look. I really like the new look. I especially like the new faucets. They are a much more interesting design than the originals. I really like them. I have always hated the faux marble look that so many bathrooms have. This is not trying to be anything other than pretty. Nice! I LOVE your new countertops! They look amazing! Looks great! 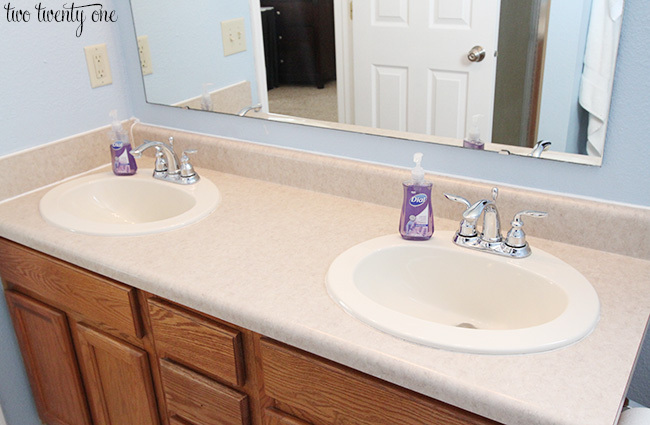 We were looking at different products to replace our vanity top and after seeing yours, we may just go with Formica. That bath vanity is gorgeous!! Love the pattern. I like the pattern on the new countertops and that they look so shiny! We’re in such need of new countertops. This would be so awesome for our house! 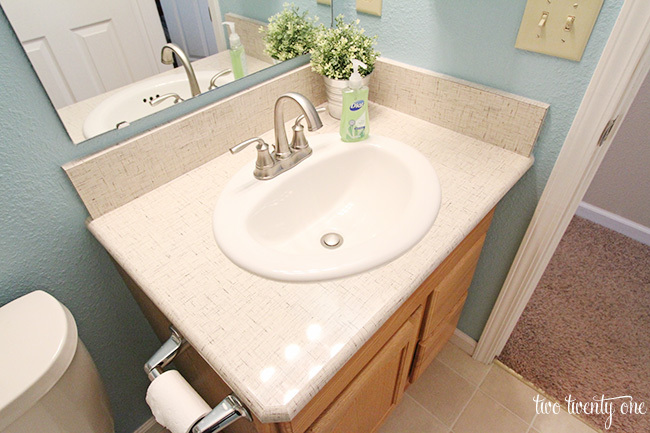 Your new countertops look amazing, and they really make the vanity stand out! I have to say I’ve never seen that color vanity top. Nice choice. I am also in the middle of redoing my main bath. Little by little right? Your countertops look great. The style you picked out is nice because its shows some texture and is neutral enough to look good with almost any style of bathroom and its not an “in your face” bold pattern. It’s very nice. I like how the new Formica countertops are rounded to look like stone. I think staining your existing cabinets is a great idea! It’s a great frugal change. I love the look and design! Thanks for sharing at Creativity Unleashed.